Thousands (73,000+) Protest Planned Parenthood Nationwide! 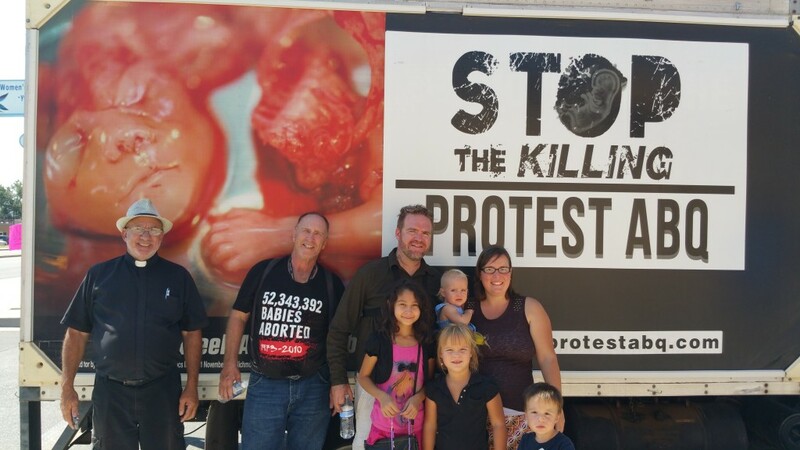 Albuquerque, NM- On August 22nd, Pro-Life Americans held the largest pro-life protest in American history! Over 350 cities across 49 states…and also in 5 countries! 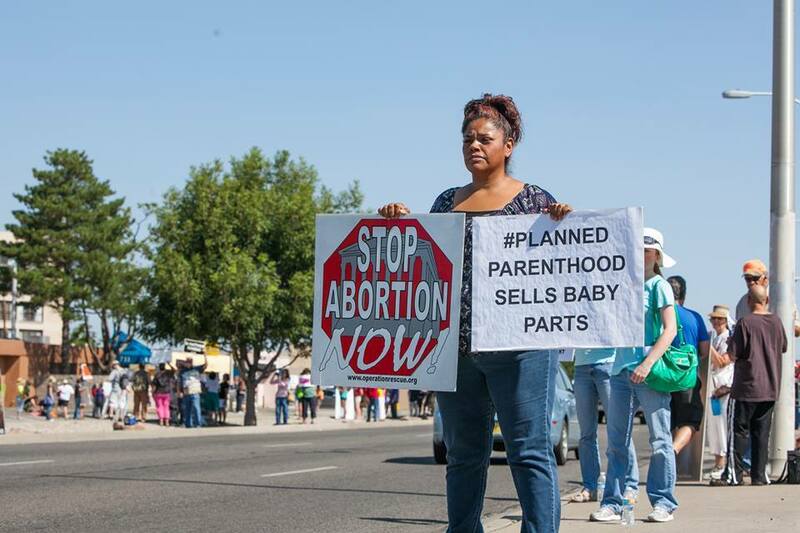 New Mexicans also held the largest protest EVER against the killing business of Planned Parenthood in their state. 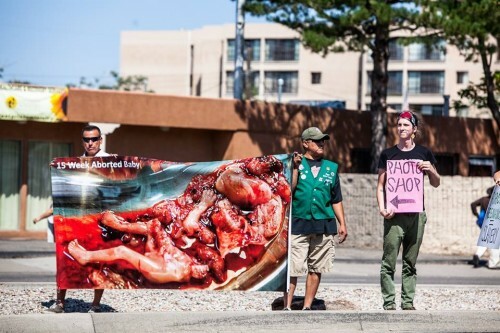 The Albuquerque protest drew 500-600 New Mexicans out to protest the only Planned Parenthood surgical abortion center in the state. There were protests also held in Farmington and Las Cruces New Mexico. Protest ABQ sponsored the Albuquerque protest and co-lead it with Fr. Stephen Imbarrato of Priests for Life. The historic protest sent a strong message of solidarity and resounding declaration to political leaders in New Mexico that New Mexicans want to end pre-born child killing in this state. 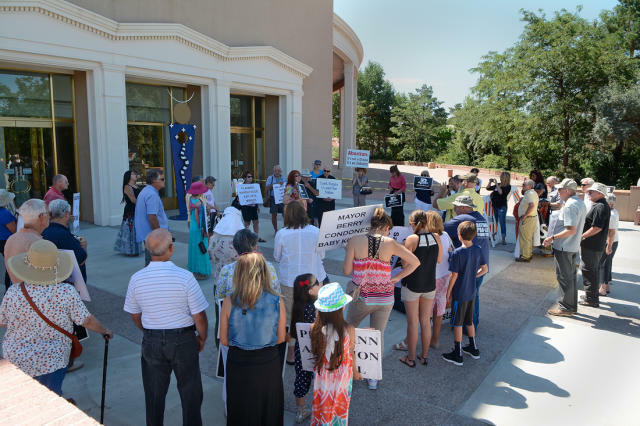 Many in attendance expressed their encouragement of seeing so many of God’s people out to protest evil and affirm what must be stopped, the murder of New Mexico’s children. Many of those who attended mentioned that this was the first time that they had ever protested at an abortion clinic. 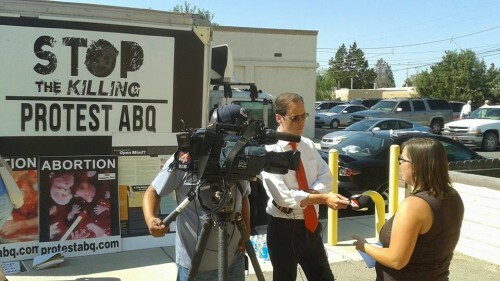 During the press conference Tara Shaver, Spokesperson for Protest ABQ spoke to the fact that, 5 state governors have de-funded Planned Parenthood and 13 states have launched criminal investigations into Planned Parenthood’s baby body part for profit scheme. All the while New Mexico fully funds abortion through state Medicaid with our tax dollars and abortion facilities are telling patients that their babies remains may be used in medical research which violates New Mexico law. Furthermore, is it any surprise that NM is currently ranked 49th for children’s well-being, when our leaders continue to ignore the plight of the smallest children in our state? Every pro-life person is rightly outraged and disgusted by the crimes against humanity taking place in abortion killing and harvesting centers yet our self-proclaimed pro-life Governor has done nothing to make sure that these crimes are not being committed in her state. If you want to join the pro-life protest movement in ABQ please fill out the Join Us form here through the Protest ABQ website. Protests are always prayerful, peaceful and law abiding. We look forward to seeing you out on the street! 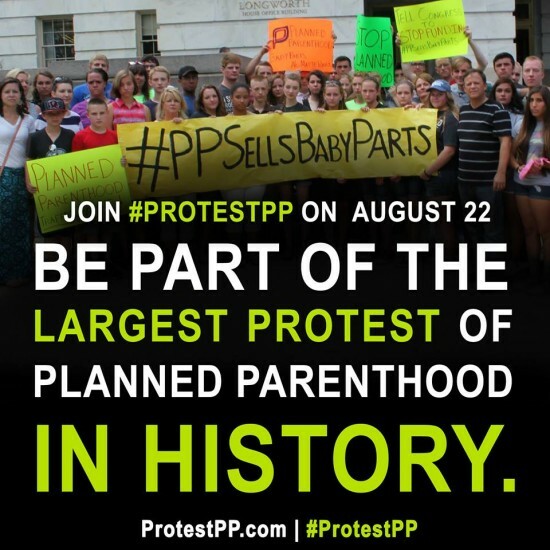 Albuquerque, NM- On August 22, 2015 over 50 national Pro-Life organizations including Protest ABQ are co-sponsoring, #ProtestPP, the largest nationwide protest of Planned Parenthood in its history. 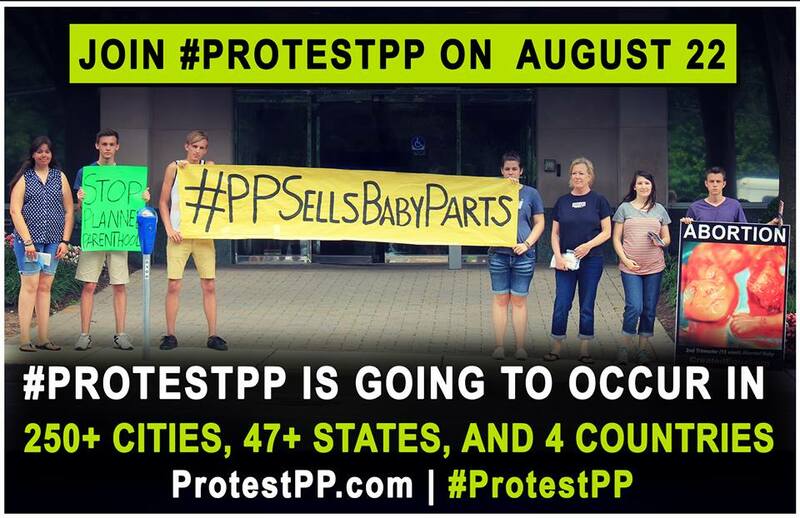 Over 280 cities are signed up to hold protests at Planned Parenthood abortion facilities in 47 states…and counting! These protests are being held to further oppose the atrocities of Planned Parenthood which include the recent videos released by the Center for Medical Progress that expose their practice of selling the body parts of aborted babies. Planned Parenthood is the nation’s largest abortion provider. Breitbart reports, “According to its annual report, Planned Parenthood performed 327,653 abortions in 2013.” Planned Parenthood also receives more than half a BILLION dollars EVERY year from American taxpayers. Protest ABQ has organized the protest in Albuquerque, New Mexico and will co-lead the protest with Fr. Stephen Imbarrato of Priests for Life at the Planned Parenthood surgical center located at 701 San Mateo Blvd. NE. The protest will be held from 9AM-11AM (MT) we encourage and welcome everyone including families with children. A press conference will also be held at 10:30AM. 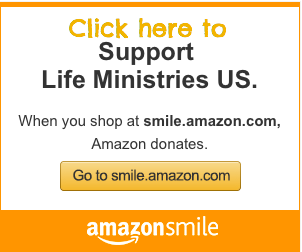 “It’s time for the pro-life movement to become a protest movement and recognize our civil responsibility to peacefully assemble to allow our collective voices to reach the ears of those in positions of authority. 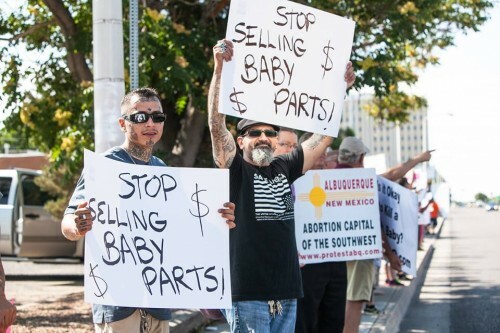 It’s time to end this barbaric injustice once and for all, the legalized murder of pre-born children in the womb,” stated Bud Shaver, Executive Director of Protest ABQ. It has been reported that the radical abortion rights group, Stop Patriarchy, has called for counter protests on August 22nd. In an e-mail sent out by the group, they can muster up counter protests in only 6 (of the scheduled 280) cities nation-wide. Albuquerque is one of the 6 cities that they are vowing to counter protest. Stop Patriarchy whose mantra is “Abortion on Demand and Without Apology,” which really equates to “I want to be able kill my baby for any reason up to the day of birth with your tax-dollars and without apology” is known for being opposed to the so-called war on women’s right to kill their children.Ironically, they ignore the fact that half of the babies killed by abortion are female and that abortion is the ultimate degradation of women who are the only gender that have the unique ability of bringing new life into this world. Back in 2014 a small group of “rowdy” Stop Patriarchy counter protestors invaded an Albuquerque hotel to disrupt a banquet held every year by a local Pro-life group. The disruption by the militant pro-abortion group Stop Patriarchy was caught on video. Protest ABQ has contacted the Albuquerque Police Department (APD) and alerted them to the potential for counter protesters in Albuquerque on August 22. This is to ensure that they protect the safety of everyone in attendance and to make sure everyone’s constitutional free-speech rights are protected. On Saturday, August 22, pro-life Americans throughout the country will gather at Planned Parenthood locations nationwide to protest the abortion giant’s barbaric practice of aborting babies and selling their body parts. The Albuquerque Journal published two stories, Aug. 9th in the Sunday edition, about Planned Parenthood and even mentioned our upcoming Planned Parenthood protest. The documentaries released by the Center for Medical Progress have shaken the killing business of Planned Parenthood to it’s core but we must keep the pressure on. When: Saturday, August 22, 9:00-11:00 a.m.
Be a part of this nationwide event and take a stand against the evil of abortion. Flyers for distribution can be downloaded and printed here. Bulletin inserts for churches can be downloaded and printed here. 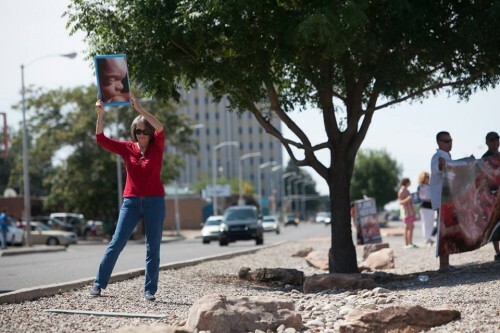 The Aug. 9th Sunday edition of the ABQ Journal covered our Protest of Planned Parenthood on Aug. 22nd.